Thankfully, gone are the days of ill-fitted, shapeless suit pants for women. The world of corporate fashion for women has come leaps and bounds in the last decade and there are now so many great pieces to choose from. 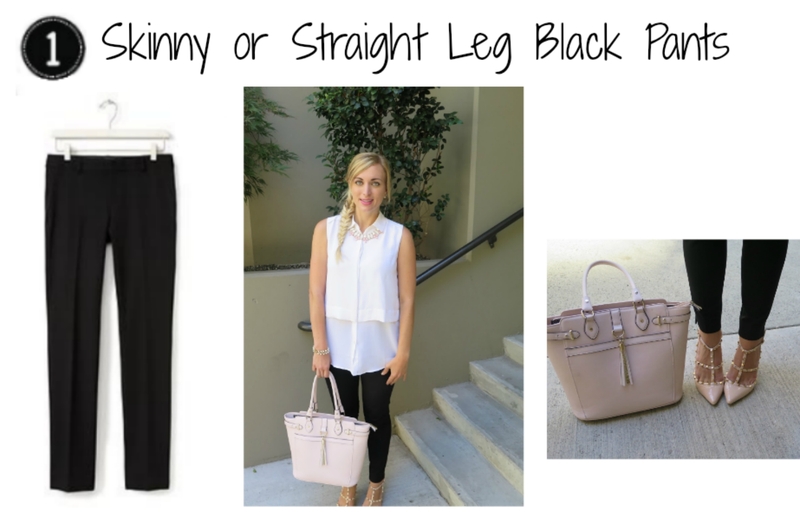 My #1 office essential is a great pair of straight leg or skinny black pants. They are the base off which to build your office wardrobe! My top pick black pants are above. For other great options see here. I especially love these Elizabeth & James pants. 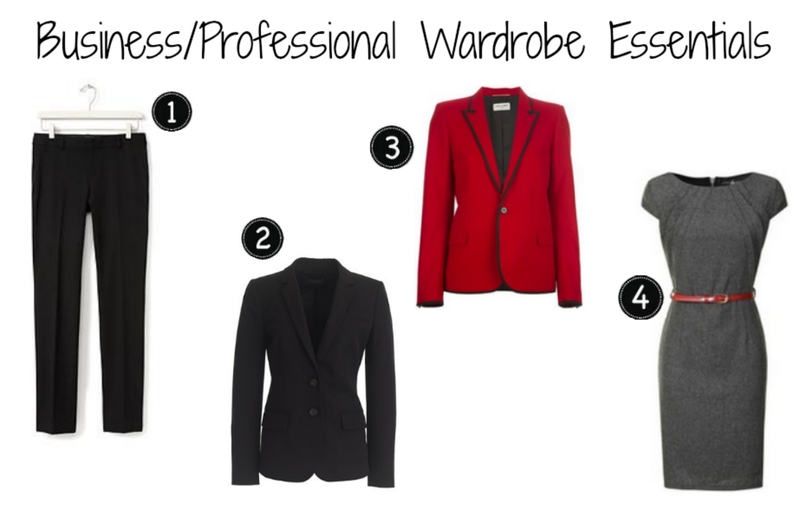 In addition to a black blazer, an essential is a fun blazer – something in a great color or with a unique shape. 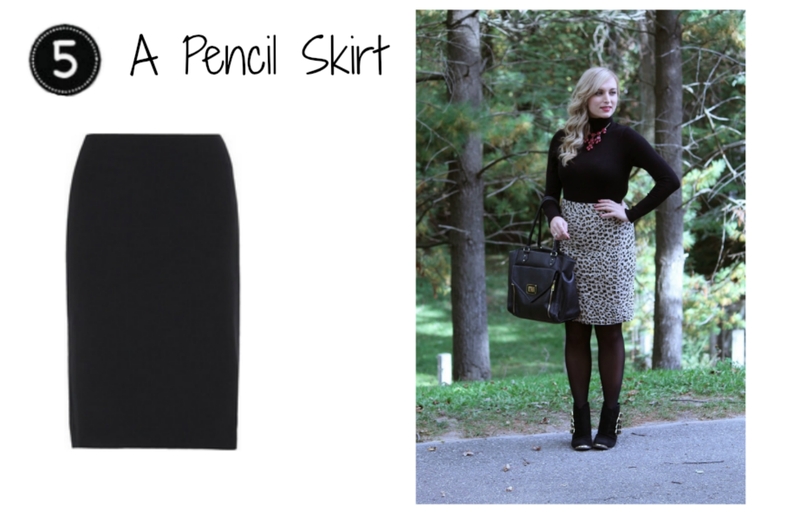 This is a great way to add some personality into your office wear. A selection of great blazers can be found: here. At under $60 I am swooning over this pale pinstripe one. Every office wardrobe needs one great sheath dress. It’s a versatile piece as it can be worn with a cardigan or a blazer, and you can add different accessories such as coloured tights or a neck scarf to really change up the look. See my favourite sheath dresses currently available in the widget below! A white button up is a classic item that everyone should own. Personally, being the busy woman that I am, I live in non-iron ones. There are a number of great non-iron basic blouses available right now – you can see my top picks in the widget below. If you follow along with LegalLee Blonde regularly, you’ve heard me talk time and again about the importance of day-to-night clothes. It is so valuable in today’s busy world to wear something to work that you can easily transition to your after work plans. 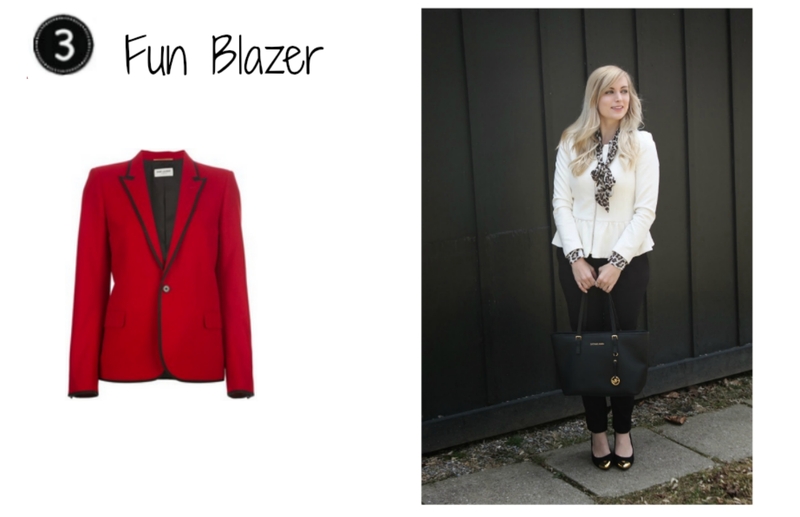 A great top that looks professional under a blazer, but fun without one is key. 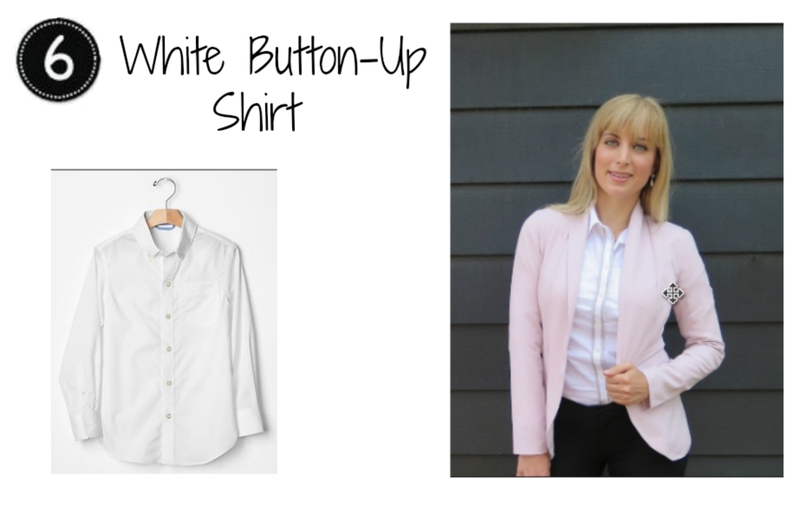 There are many shirts that work for this task – a split back hem shirt, a shirt with lace or leather sleeves, or really an shirt that you find fun! My top picks for day-to-night shirts are in the widget below. AND all are under $50! And last but not least – Comfortable heels!! Believe it or not it IS possible to find heels that you can survive the entire day in. My two favourite picks are listed above. For other great heels check out these. This is such a great post for any working girl out there! Its great to have the breakdown of each item too! Thanks Amanda!! I worked really hard on this post (it took SO LONG haha) so I really appreciate the positive feedback! loving all these classic work outfit. Thank you so much Casey! I wanted to really breakdown what young professionals need and give them options that are affordable! This is a great list of workwear necessities! Thanks so much Jill! Glad you like it!! 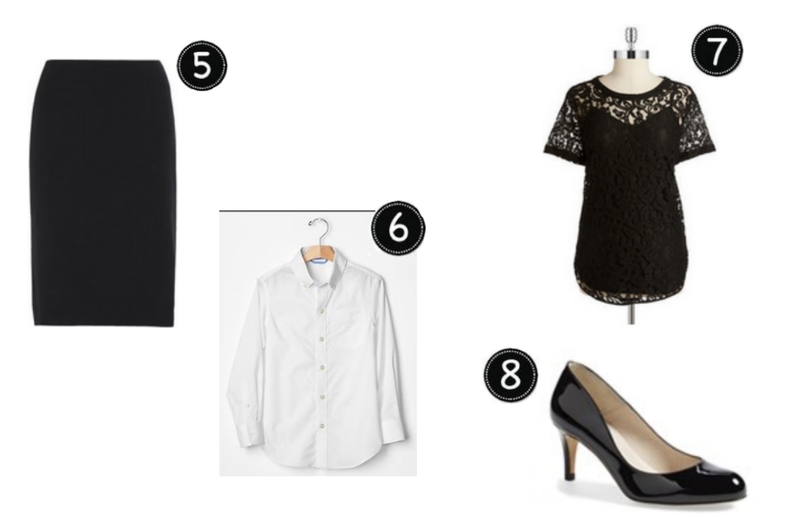 These are definitely workwear essentials! I love your picks! Aw thank you Laura!! I worked so hard to find the best picks, so I am so happy you like them! These are great! I have a few blazers thanks to work! I am trying to get one in every color! Ahh I would love one in every color – such a dream work closet! I love this post! I did something similar to this a few weeks ago for back to school essentials for teachers. So important to be professional and comfortable! I love your picks, they're perfect! Ah that is awesome! Great minds think alike right?! I will definitely have to check out your post for teachers – that is a great idea! One of my best friends is a teacher so I will have to tell her to check it out too! These are lovely business outfits. I definitely gathered some inspiration from the last photo. This dress was made for you, so cute! Congrats to your aunt! Great tips and so many great classic pieces! Thanks for linking up with Beauty by Miss L Weekly Fashion Link Up!